This ‘what games’ question is one of my favourites to ask when people are stuck trying to figure out their natural gifts and talents. You see, as children we typically know who we are and what we want to do. We haven’t yet (hopefully) been molded and cajoled by the well-intentioned people in our lives into being what they think we should be and into doing what they think we should do. Our underlying personality patterns are part of the hardwiring of our brains. As kids, these traits can show up at a very early age. You don’t need to be a parent to notice that some kids are just able to talk non-stop about anything and everything, and other children are more quiet and barely say a peep. These can be clues as to whether a child has a preference for introversion or extraversion, and can be critical pieces of information when it comes to successful parenting. 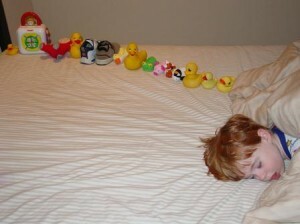 What can you tell about a child whose toys are lined up and all the ducks are in a row, so to speak? Well, maybe you have child on your hands who likes structure and order and traditions.Whether you value these things or not, they are part of the child’s DNA. Can you remember what games you played as a child? Can you remember how you lined up your toys, or not? Do you recall if you loved quiet games like hide-and-go-seek and cherished the solitude of the perfect hiding spot no one could ever find? Did you find the strategy games more to your liking where you had to think 10 steps ahead to build cities or re-enact global conflict? All of these things give us clues to our natural personality preferences and help us understand our natural gifts and talents. Now, if you’re a non-believer when it comes to a theory that says we’re born with a certain predisposition, rest easy in the knowledge that as mature adults, we can make choices about what we do and how we do it. Just because we may be more Extraverted than Introverted, doesn’t mean we don’t enjoy the solitude of a good book or a quiet evening with just a friend or two. But based on the popular Myers-Briggs theory, we are naturally better at one than we are at the other. This means that our default is to behave in a certain way, and we call on our default more often than not. As a leader, understanding our own defaults is critical information when it comes to leadership success. Understanding our own hard-wiring can help us understand the underlying force that drives our leadership style. How we make decisions, for example, is one part of our personality that can drive our teams crazy. If we like to make decisions on our own after we’ve gathered all the information, we may not be communicating the thinking process behind our decisions. And we may not feel as though we have to. Imagine that your boss has actively sought out your opinion on a particular subject. She has been interested and perhaps even receptive to your ideas and opinions. A few day later the decision is announced and it’s totally different than the thoughts you shared. You are left wondering if your boss disregarded your expertise, went against you intentionally, misunderstood you, or just didn’t listen? It’s natural for any one of these things to go through your head. Perhaps you have erroneously assumed that your boss was asking for your advice and not your opinion, or perhaps your boss’ personality default has her gather information from a variety of sources, then go off and make a calculated decision on her own, and not feel the need to share decision rationale with the team. If the latter is the case, then you’ve bumped into your boss’ personality preferences. Now imagine that you knew enough about your boss to know what had occurred. But what if you didn’t? These types of situations lead to misunderstanding and lack of trust that have implications down the road for you, your team, your company, and your customers. Now switch spots and imagine that you are your boss. A member of your team seems unhappy or disgruntled the next time you ask for their input. She’s more reserved in what and how she shares information with you. This potentially could have been avoided if you had only understood your own default decision-making style, and the impact it has on others. You could have made the effort to give the team member the heads up about the decision, or given more of an explanation when you announced the decision, even if you didn’t think the situation warranted it. But by understanding your defaults, and the defaults of the members of your team, you can reduce or eliminate many of these personality-based misunderstandings that can cause huge conflict in teams. Understanding how to motivate a team is one aspect of leadership development that is sometimes overlooked. Considered to be one of the “soft” skills, some leaders don’t give it much thought. But understanding personalty patterns using Myers-Briggs can help leaders build strong teams, develop highly productive team members, and boost team morale, all at the same time. So, what games did you play as a child? A great question to kick off your next team meeting.